- management of communications to ensure that core messages are delivered consistently to the widest possible audience free of any contrary information of interpretation (filters). Since 2003, and with one exception, government communications have focused almost exclusively on reinforcing the "Danny" brand. The concept is simple. To borrow marketing phrases, voters were first convinced to purchase the product, based on the brand. Having secured the first purchase, Williams' marketing efforts have switched to brand maintenance. That is, the main goal switched from increasing market share - number of votes, number of seats per se - to an essentially defensive or reactive mode of maintaining what was already won. Voters that once had to be convinced to buy brand "Danny" must now be reassured their their brand choice was the correct one. and will continue to be the correct one. This does not mean that Williams is passive. Far from it. He relentlessly protects the brand. Any information contrary to the Williams message is attacked. Enemies are identified and labeled as such, including local special interest groups such as NOIA, the successful candidate in a job competition or dissatisfied former papermill workers whose criticism of government, i.e. of Danny, is label "dissent". The word is not far removed from heresy. Such is the level of defensiveness over the brand that Williams will go so far as to attack a small and extremely weak political party in a single riding for doing nothing more outlandish than what he himself did in the run-up to the 2003 general election. In the small Newfoundland and Labrador market, Williams efforts have been phenomenally successful. The Liberal and New Democrat parties are effectively neutered. On the major policy issues, they are more inclined to agree with Williams than disagree and where they have attempted to inject other ideas - such as the supposed abandonment of rural Newfoundland by Williams - their efforts have been lacklustre at worst and half-hearted at best. This has only served to reinforce Williams' brand dominance. Their has been no slackening in Williams' defense of his brand, no matter how high his climb in the polls. But what is the "Danny" brand? To see it clearly , we can apply six commonly held attributes of a brand. First a brand must simplify choice. Voters do not need to research detailed policy positions or examine Williams and his team closely. They may simply understand that "Danny" represents a "new approach". The choice is the classic marketing option: the old guys and something supposedly entirely new. Facts and details are irrelevant. Research suggests that voters most often form impressions of candidates and parties based on certain characteristics and may rationalize their choices after the fact. Simple choices are easier to adopt. Second, a brand must be unique. In Williams' case this should be self-evident. While the other political parties may run as a team and, in the last election, ran veteran politicians, Williams was able to capitalize on his personal wealth to portray him self as the "anti-politician" incorruptible by the need to seek re-election. Third, a brand must minimise risk for consumers making the choice. In the initial purchase, voters could be reassured that Williams had never failed at anything he had done, or so the campaign messaging suggested. Williams himself repeated that he was about action and accomplishment, about creating jobs. "Danny Millions" could hardly be a risky choice. In any oil and gas issue, Williams is especially keen to use a variation on this theme even if it means accusing someone - even by implication - of being a vendu. Fifth, a successful brand must embody commonly held values. This may be as simple as Williams' repeated claims to be standing up for Newfoundland and Labrador as an expression of his passion for the place and its people. Sixth, a brand must contain credibility. Williams-pre-election messaging capitalized on the extensive advertising for his law firm under the slogan "Who will fight for you?" It also reinforced his own personal success as a lawyer and as a businessman. During the 2003 campaign, Williams repeatedly pointed to his successes in the past as evidence of what he can and would do once in office. In dealing with questions on the economy and the province's financial woes, Williams began to refer to his own record as being about "jobs, jobs, jobs". No surprise, therefore, that in his now infamous January 5, 2004 speech, Williams created for himself the only political crisis of any consequence during his term of office thus far. Having promised jobs and growth, Williams first major public address was a poorly delivered that starkly laid out the need for cuts to government spending and massive public sector layoffs. Williams polled relentlessly in the following months, using a pollster he had come to rely on. After the public polls by Corporate Research Associates showed a precipitous drop, Williams ramped up the public rhetoric as a fighter for Newfoundland and Labrador over the supposed injustice of offshore oil revenues. His own private polling likely showed similar declines coupled with some less than enthusiastic support for his approach. A combination of factors saw the polling numbers remain low into the following fall. However, after his theatrical departure from a first ministers meeting in October, Williams personal popularity and the popularity of his government soared. In January 2005, he declared victory in a fight with a traditional bogeyman for provincial politicians. But more importantly, the messages of restraint and government restructuring vanished. The program review initiative, aimed at re-organizing government itself, disappeared without mentioned and in the 2005 and 2006 budgets, Williams boosted public spending well beyond the rate of growth in the economy. The result, however, was unmistakable. The CRA public polls, even allowing for any methodological problems, showed growing popularity for the "Danny" brand. In itself, this served to further reinforce the notion common to permanent campaigns that popularity is a synonym for success and that as a consequence, any policy action by government is legitimate. If Williams and his ministers do not say it directly, such an interpretation is sure to come, for example, from the mouth of one of its former employee currently occupying an influential media position. 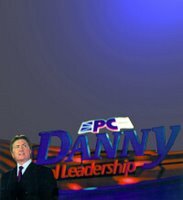 Danny Williams enjoys continued political success by applying simple marketing techniques built around the concept of branding. Simple messages, relentlessly carried by official sources, support the brand and, using typical political campaign techniques, any contrary messages are ruthlessly neutralized. Never mind that one of Danny Williams' own companies is itself a member of the offshore supply association; since they dared to speak at all on the Hebron deal they have been branded as "annoying" and as serving only their own narrow interests. Fundamentally, they are standing against the "New Approach" of "No More Give Aways." Danny Williams approach is a long way from traditional notions that draw a sharp distinction between campaigning and governing. His permanent campaign, built around a simple brand, has proven remarkably successful. It is difficult to give it a proper test, though, since Williams has enjoyed the near absence of political opposition and a financial situation that gives him as much cash to spend as he wishes. One thing can be said with some confidence, however: Bill Clinton and Tony Blair may have been accused of being permanent campaigners. They are pikers compared to Danny. Only the brave gamble with HQ? he spoke. and rapidly drank a glass of water. A European war instead Jack? Whips and chains and gags? Oh my!